New technologies are changing the way students learn. In the not too distant past, students required to create a “visual database” in a course like Assistant Professor of Art History Tomoko Sakomura’s Contemporary Japanese Visual Culture, might well have gone scurrying to the library in search of books or slides on contemporary Japan. Perhaps they would even have ventured to an art museum, newsstand, or bookstore. Today, although students still use such physical resources, they can find most of what they need with a click of a computer mouse—often without leaving their rooms. “The visual database [which is a “wiki” site] is created by students for the entire class,” says Fletcher Coleman ’09, who took Sakomura’s course last spring. Wiki is software from Wikia that allows multiple users to post comments on a shared Web site for use as reference material, similar to an encyclopedia entry on a subject. But it also allows users to edit, expand upon, link to, or even delete each other’s postings. Thus, a wiki is intended to be a sort of collective, self-correcting compilation of information—of which the on-line encyclopedia Wikipedia is the best-known example. Scrolling down the electronic pages of the Japanese culture database, which are filled with pictures, Coleman explains, “We’re to find images of Japanese contemporary culture and post them on the site.” He stops at a large Food Network advertisement. Once you get over the initial creepiness of the image, you can see how [the advertisers] are comparing the new PS3 with the large, life-changing, colossal impact of the atomic bomb. Perhaps now [World War II] has been long enough ago to take such a shocking and disturbing image and use it for a gaming console ad. It comments on the way that Japan has progressed since the bombing and the sort of things that will provoke a reaction from its audience. I think it’s important to mention that this ad agency is in France and not Japan, but I believe it is used for more than just the French audience. “It’s been a lot of fun to see what students come up with for the visual database,” Sakomura says. Another on-line tool used by Sakomura, to which students respond well, is the blog—a portmanteau of the words Web and log. 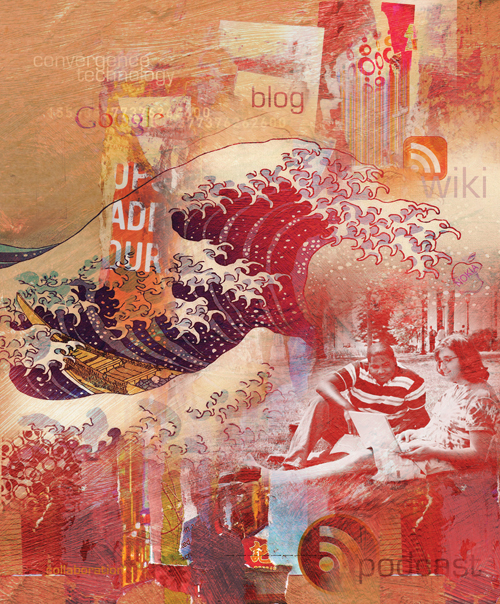 A blog is created by an individual as a personal diary or, in an academic course, as a means to post opinions that can be read by the entire class but which, unlike a wiki, cannot be altered. Coleman agrees. A double honors major in Chinese studies and art history, he finds the first impressions database informative. Sakomura agrees. “Often, students who are hesitant to speak up in class post very insightful blog comments. To encourage their classroom participation, I refer to their comments in class and ask students to expand upon their posts,” she says. I see these objects to some degree as a natural extension of Yanagi’s ideas. [Soetsu Yanagi launched the Mingei (meaning “folk crafts”) Movement in Japan and is founder of the Japan Folk Crafts Museum in Tokyo]. They incorporate some of the traditional elements of simplicity, efface the artist (though perhaps not the designer), are made for everyday use, and harmonize in some sense the use of machine and hand as it is the hand that designed these objects and the machine that produced them. Lena Wong ’10, pursuing a film and media studies major with a minor in sociology and anthropology, has taken two of Rehak’s courses, including Animation and Cinema. Her fingers move quickly as she clicks through several sites on her laptop to get to the animation class’s wiki site. In addition to her Swarthmore classes, Wong does market research for the programming department at MTV, helping the cable music channel create social networking sites that can compete with Facebook and MySpace. Yet, despite her expertise in new media, Wong believes most students contribute to or read wikis because it’s a course requirement, not because they find them educational. Sean Varsolona ’09, who has also taken two of Rehak’s courses, agrees. Wong sees the wikis “as a jumping-off point to find other sources. I don’t rely on Internet sources alone for my work, “because you can’t always know where they originated. I grew up in Silicon Valley. The ‘new’ technology is not really new to me,” says Wong, who has been creating Web pages since elementary school. Coleman came from a very different background. Raised in rural Ohio, he says he spent very little time on-line before coming to Swarthmore. Now, he checks each of his classes daily through Blackboard, a Web-based course management software that was developed in the late 1990s to facilitate communication and collaboration among professors and students. Blackboard was introduced at Swarthmore, Bryn Mawr, and Haverford in 2001 as a tri-college endeavor, according to Liz Evans, former academic computing coordinator in the College’s Information Technology Services (ITS) department. Evans reports that throughout the 2008 spring semester, 321 Swarthmore faculty members had Blackboard accounts, 65 percent of which were active; 1,489 students had accounts, 94 percent of which were active; and, of the 406 core academic courses and seminars created automatically by the College’s database system in Blackboard, 73 percent were actively available to students. Students may also submit completed assignments using Blackboard’s secure Digital Dropbox, although few of the students interviewed said that their professors used that feature. Individual grades may also be accessed through Blackboard, which is password protected. According to Gayle Barton, director of Information Technology Services, Blackboard is continually improving its software. The newest version allows professors to send messages to students. It’s ironic that although Fletcher Coleman from rural Ohio prefers to do most of his reading on-line, Lena Wong, who grew up in the high-tech world, says she still prefers the feel of a book in her hand. “You still have to read the book in order to know what it’s about and write about it. And sometimes the entire book isn’t available on-line. But I’m lucky—I can do this,” she says, spinning her laptop monitor 180 degrees and folding it down backwards so it’s flat like a writing tablet. “If a professor has put PDFs on-line, I can take notes on here, using Microsoft OneNote while reading the PDF in another program. But then there’s the whole printing thing. I hate to waste paper,” says Wong, speaking at top speed as she sits cross-legged and barefoot in the second-floor conference room of Sproul Alumni House. Coleman says he reads short articles on-line but prints out longer ones so he can make notes on the pages and take them to class—a practice that, if followed by 15 students in a class, uses 15 times the paper. “The amount of paper students use annually is huge, due to many of the reserve readings being available digitally,” Seiden says. Paper usage seems to be falling slightly, however. According to an April 2008 Bulletin article, the campus recycled 61 tons of paper in 2007, down from 63.04 tons in 2006 and 67.02 tons in 2005. “On-line readings provide the same opportunities as traditional books as well as additional ones, like links to other sources. I really do prefer reading on-line to books,” says Coleman, who has a Facebook page only because his friends made it for him. Although the College’s libraries still maintain full collections of books, films, and music, those resources are being increasingly enhanced with the new technologies. Although new technologies make information more accessible, even tech-savvy professors such as Rehak are unwilling to abandon traditional teaching and learning methods. “I’m old-fashioned in that I believe the best learning still takes place in the classroom through lectures and discussion, in the students’ writings, and in closely reading and analyzing texts,” Rehak says. “The big change, I think, is in how these materials are distributed and made available in new contexts, so that students can fit the information into their schedules in creative ways. With the rapid changes in educational technologies, the College’s ITS staff is not focusing on any specific hardware or software to bring to campus. Barton says one of the roles of ITS is to monitor new technologies and foster strategic innovation. That pace—and College support for on-line technologies—could be a little deeper, says Richard Valelly ’75, professor of political science. Since 2003, Valelly has been using a free Web site called VoteView (voteview.com) in his American Politics and Congress in the American Political System courses. The site displays a continuously changing two-dimensional plotting of ideological locations for members of Congress and Senate since 1789. But he’d also like access to other on-line tools. Wong says she wouldn’t want to pay extra for access to technology or on-line sources required for a course. “There’s so much on campus already; I would wonder why the College wasn’t supporting it. It would be different if it were an e-book and I had to buy a book for the class anyway, but not for an on-line resource,” she says. Gyi agrees. “I’d prefer not to do this. The last time I had to use a supplementary software program was for a physics class, and it had far too many glitches to be useful. It just became frustrating as the semester progressed,” she says. But Coleman says he would be willing to subscribe to an off-campus site if it meant he didn’t have to buy a book for the course. “Books are really expensive,” he says. Robin Jacobsen, manager of client services for ITS, says an emerging technology trend called “convergence” is already having an impact on campus. One example is the Apple iPhone, a device that combines voice, text, e-mail, and Web access through either cellular or wireless IP. Jacobsen says another model of convergence uses voice as a data service but also includes text messaging, video, and pictures. 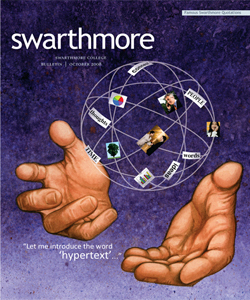 In terms of voice technology, Jacobsen says that Swarthmore has “a strong IP backbone” and that, in the future, faculty, staff, and students will be able to receive voice messages through their e-mail accounts. “Convergence will increase mobility and will be a key factor for students who need access to campus technology when abroad or off campus,” Jacobsen says. ITS is currently exploring collaboration and communication solutions that combine computing and software services including e-mail, instant messaging, calendars, document sharing, and concurrent documents. Barton says that convergence technology or “mashups”—links between different Web applications such as Google maps and Craig’s List—will enable currently discrete technologies to work together. According to Jacobsen, another technology that’s growing in popularity is the podcast. A podcast is a digital audio file available on the Internet that can be played on computers or portable media players and is usually distributed through Web-feed formats such as Really Simple Syndication and Atom. Podcasts are also created by students within the framework of their coursework. In spring 2007, Varsolona created five- to seven-minute podcasts for Rehak’s course From Broadcasting to Podcasting: Television and New Media. “I made a podcast that looked at how Hillary Clinton’s campaign used Web resources and another on how Saves the Day, which is a band I like, uses the Web to promote its music. “We then were able to listen to each others’ podcasts via iTunes in class and in our rooms. It was another way to learn information not covered in class. I really enjoyed it,” Varsolona says. Professor of English Literature Peter Schmidt was a podcast pioneer on the faculty. Beginning in 2004, for some of his classes, Schmidt asked students to choose and read key passages from literature—the authors ranged from John Steinbeck to Jonathan Franzen ’81—and then add five minutes of commentary. The professor and members of the class then listened to podcasts on that week’s reading before class and used these to generate some of that day’s discussion points. “The assignment returns to the foreground both the virtues of reading aloud and doing a close reading of one passage to see how it can give us in microcosm some idea of the larger work,” Schmidt says. Barton foresees students using an ever-increasing number of digital media collaboration tools. A native of Kansas City, Mo., Audree Penner majored in communications at the University of Missouri–Columbia. 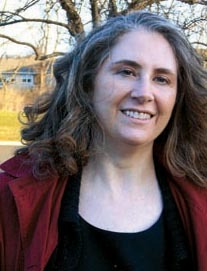 She has served as an editor and writer for magazines and newspapers in Missouri, Kansas, and Pennsylvania. For the past 17 years, Penner has been a staff member of the College Publications Office, where she serves as the Bulletin’s desktop publishing specialist and Web administrator.